I'm happy that you could join us this week for our challenge! Plus you've earned an extra chance to win, yay! super cute card using Pattie's digi. Thanks for playing along with Pattie's Creations Challenges.. hope to see you again next week. Is that ribbon or a paper punch?? Very nice. Thanks for joining Pattie's Creations Design Challenges this week! What a cute, glittery card! Thanks for playing in our Beary Sweet Challenge! 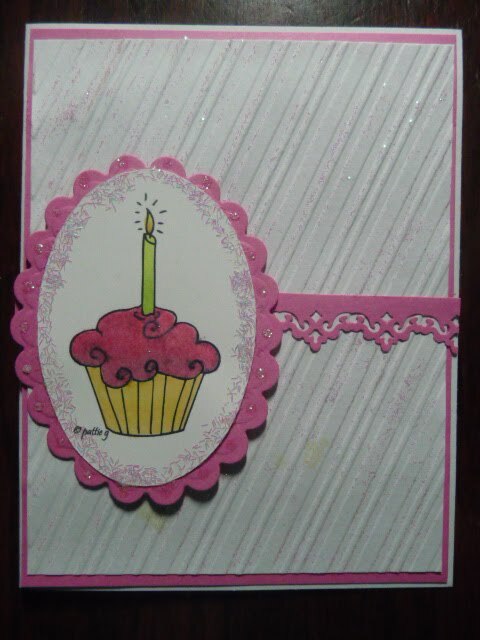 what a beautiful girly card :) i love the glittery frame ;) great job! Please join us again this week with the anything but a card challenge. Thanks for joining us over at Patties Creations!!! Very cute card,Thanks so much for joining in our Anything Go's Challenge and I hope to see you back Dec 1 for a new challenge. Very cute!! Thanks so much for joining our challenge at STAMP-N-DOODLE!! This is so sweet! Thanks so much for joining our Beary Sweet challenge - good luck!